My SharePad screening for buying opportunities has short-listed Character (LSE: CCT) as a possible longer-term investment. The attraction here is a quite extraordinary story about buybacks. 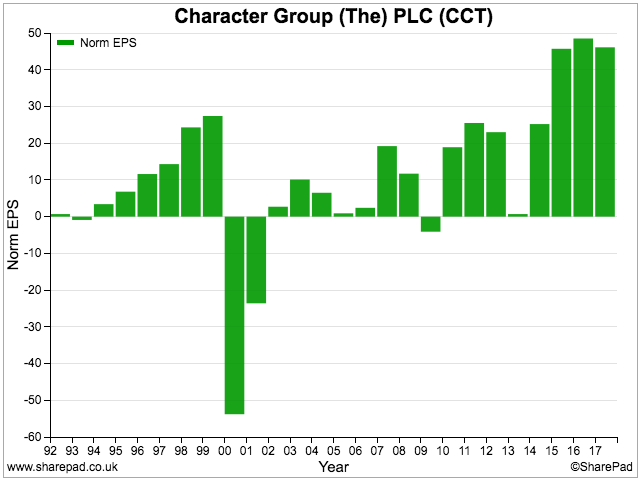 You see, since 2006, this small-cap has bought back shares every year to reduce its overall share count by a huge 60%. What’s more, the purchases have been an exemplary use of surplus cash. The average price paid was 143p, and the shares currently trade above 500p. Needless to say, I now ask myself whether further significant buybacks at Character should prompt us to invest, too. So, let me explain how SharePad unearthed Character’s remarkable story, and provide you with lots of other information you may find helpful. Let’s start with the basic theory of buybacks. A company spends excess cash on purchasing its own shares and, in turn, earnings per share — and therefore the share price — should benefit over time from the reduced share count. Alas, the buyback reality is not so clear-cut. The trouble is, many companies acquire their own shares through ongoing buyback programmes — which seemingly pay little attention to the actual price paid. As such, investors often face questionable buybacks. BP for instance has spent more than $60bn buying its owns shares during the last 20 years, and its share price has gained only 50% during those two decades. So, for buybacks to really make sense, the share price has to offer value. And as we will see with Character, if the company makes intelligent buybacks and performs well, then the share price can produce significant gains. 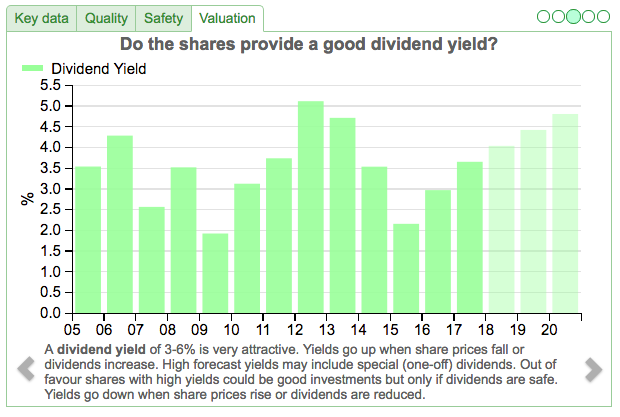 I have used SharePad to trawl the London market for companies with a decent buyback habit. 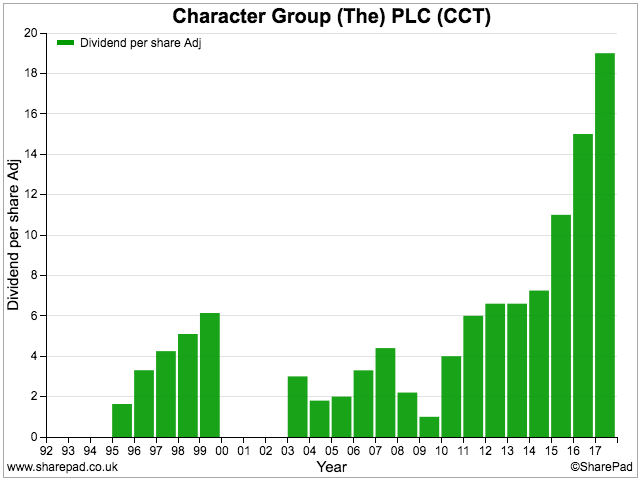 My first filter was to ensure the latest share count was less than the share count from ten years ago. SharePad returned 51 names, and I was encouraged to see class acts such as CLS, Rightmove, Next and JD Wetherspoon within the shortlist. Character displayed the largest share-count reduction, and was also blessed with net cash and a relatively modest forecast P/E. I therefore felt the share deserved further attention. So, let’s double-check Character’s buyback history using SharePad. Ideally, we would like to compare the two. 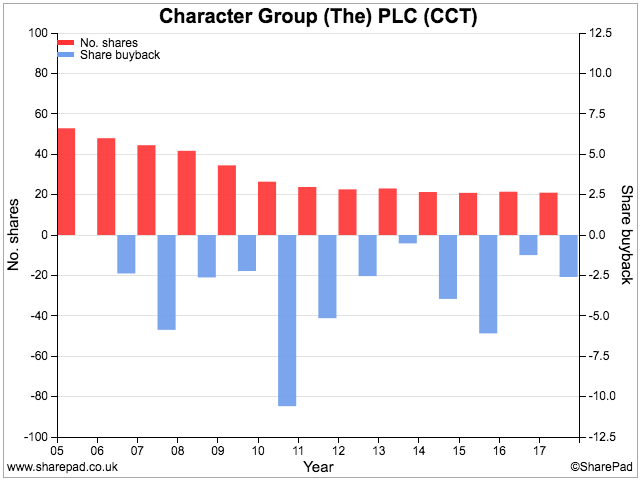 The red bars show Character’s year-end share count reducing from more than 50 million to 21 million (left axis) since 2005. Meanwhile, the blue bars show the money spent on buybacks (right axis) every year since 2006. 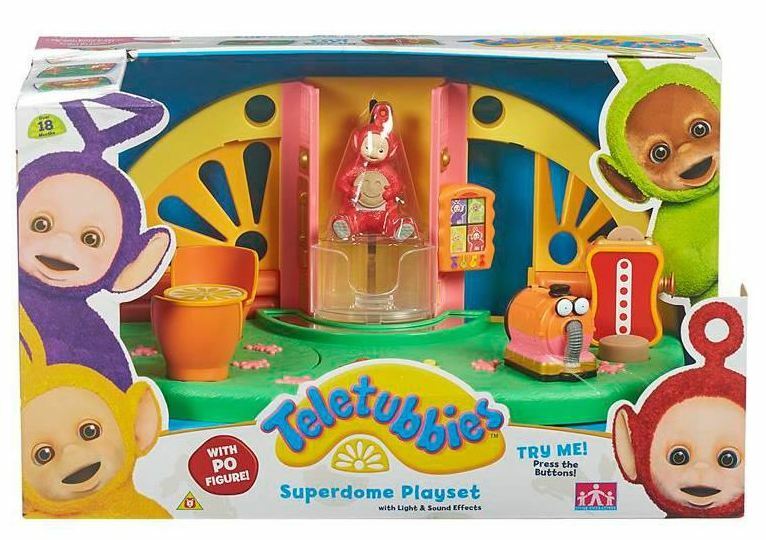 I should make clear that Character does not own the intellectual rights to Peppa Pig, Teletubbies, and so on, but instead pays licence fees to their owners to manufacture the products. The group does own some in-house brands, but I can’t say they are well known. 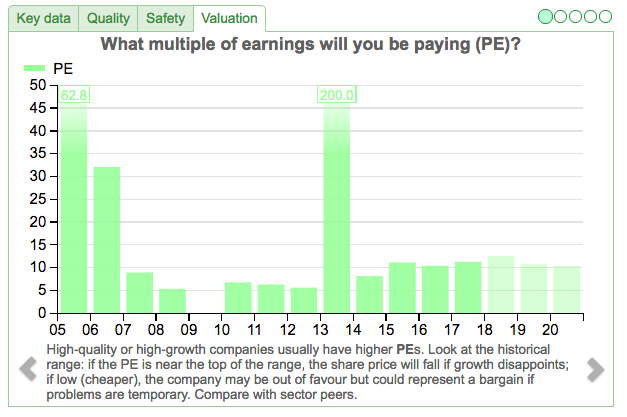 True, EPS has been up and down. But unlike Character’s operating profit within the earlier chart, the recent EPS highs are much higher than the highs of 1999 and 2007. Such per share ‘outperformance’ is due to Character’s buybacks. 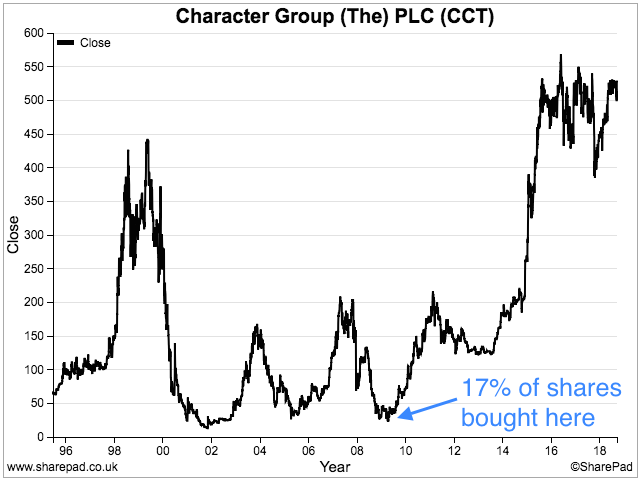 A transaction that must surely rank among the market’s best-ever buybacks occurred during 2009, when Character acquired 7 million shares (then 17% of the share count) from an institution for 30p a share. Just so you know, Character’s latest buyback occurred during January at 455p. I guess it is no coincidence that the impressive buybacks have been orchestrated by directors who own plenty of shares themselves. The eight board members listed own a collective 20% of the business — an aggregate stake worth approximately £22m. So, it appears the directors have sold some of their own shares back to the company. Such ‘related-party’ transactions are never ideal, because you never really know if the directors are putting their personal interests ahead of the interests of the company. However, in this case the directors have generally been wrong to sell to the buyback programme … at least to date. Perhaps the directors genuinely care for the business and its shareholders. I mean, the lead executives all helped establish the firm back in 1991 and have run the show ever since. In addition, the non-exec chairman is a company founder and a former chief exec. Mind you, the executives do not appear underpaid. “Each of the executive directors is also entitled under the terms of his service contract to a bonus in the event that specified performance targets are met or exceeded. 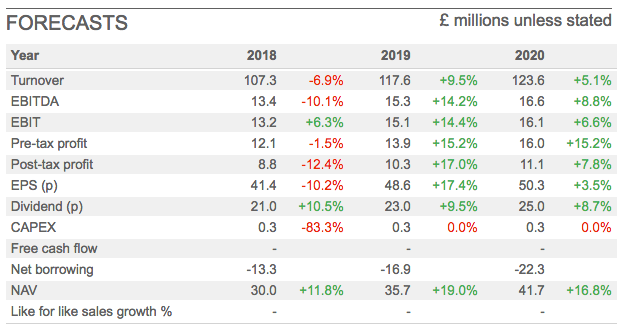 These targets are based on certain profit levels being achieved in each financial year of the Group, adjusted to exclude certain exceptional non-trading items. Taking 7% of pre-tax profits every year (assuming a target is met) seems very generous to me. 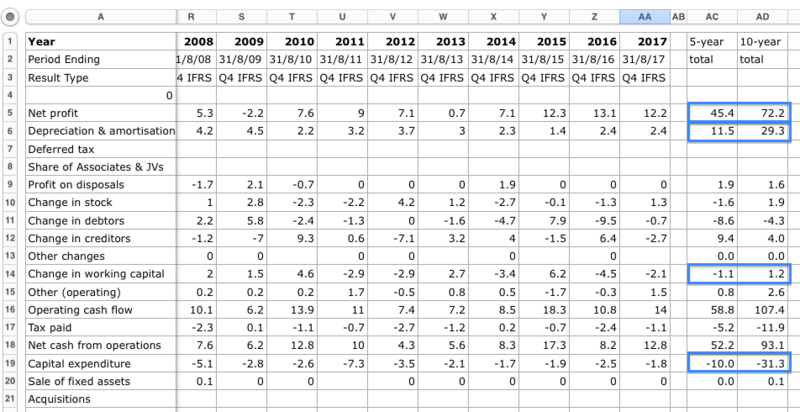 Remember that desktop spreadsheet I downloaded earlier? It can also be used to double-check Character’s accounts. My extra columns do not indicate any cash flow shenanigans. In particular, I can quickly see the five- and ten-year ‘change in working capital’ totals are both negligible compared to the aggregate net profit reported during the same periods. Furthermore, the five- and ten-year figures for depreciation and amortisation are both close to the comparable capital expenditure sums. As such, I get the impression Character converts nearly all of its accounting profit into cash — which is perhaps why the firm has enjoyed plenty of money to spend on buybacks. I also note the ‘Acquisitions’ line is empty — telling me Character’s growth has been entirely organic. Character’s recent progress does not seem too bad to me. True, first-half results issued during April showed profits down by a third. However, the setback was due mostly to adverse currency movements and the collapse of Toys R Us. Meanwhile, underlying trading appeared resilient. Screening on SharePad can often bring up fascinating candidates for your portfolio. Certainly, I have never really considered Character before. I guess the firm’s track record — exhibiting occasional losses and missing dividends — underlines my feeling that toys are a difficult sector to enjoy predictable returns. And yet, you can’t really argue with management’s buyback decisions. The share count has reduced significantly and converted the stronger trading of the last few years into much higher EPS. The share price has boomed accordingly. As I say, I now ask myself whether further significant buybacks at Character should prompt us to invest, too. I guess each of us can only make that decision for ourselves. As mentioned earlier, the last share buyback was performed in January at 455p. 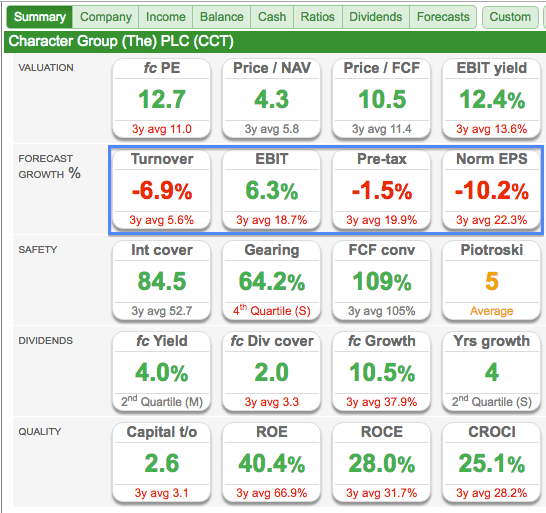 Until next time, I wish you happy and profitable investing with SharePad. Disclosure: Maynard does not own shares in Character.